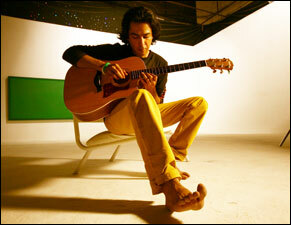 Shehzad Roy has always been one musician who has managed to reinvent himself over the years. Starting off as a pop star with a penchant for ballds, he moved into bhangra with his duet with Sukhbir. And then he reinvented himself yet again with 'Sali' and the diverse album Buri Baat Hai. Plus, the song 'Yaad' and the video featuring Vinny will go down in history as on the loveliest ballads ever. From the diversity of his music to his styling – the Roy boy has kept up with the times. 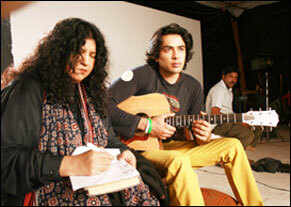 And the reason as to why Shehzad Roy's been chosen as this week's hotstepper is simple: he has the guts to collaborate with Abida Parveen. Of course, he has taken the smart route, strummed the guitar and let Abida sing, but to sing with woman who is by far probably the most popular Pakistani singer both at home and across the border, takes courage. But that comes from Shehzad's self-assurance. Music is not the only thing he does, but it is one of the elements in his life. His commitment to Zindagi Trust is on going. And to follow up a toe-tapping, chart-rocking number 'Sali', with his collaboration with Abida Parveen on 'Ao Day Dain Inhain Zindagi', Roy seems to understand the bigger picture pretty well. And that he has roped in Abida Parveen whose appeal is not just in pakistan's urban centres but also in villages, his message will be heard far and wide.